Published: Jan. 14, 2014 at 09:55 a.m. 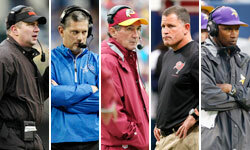 Updated: Jan. 14, 2014 at 04:46 p.m.
Don't be surprised if the Cleveland Browns are the last team standing in this winter's coaching hunt. NFL Media Insider Ian Rapoport tweeted Monday night that Broncos offensive coordinator Adam Gase looms as a leading candidate for the job, while Mike Klis of The Denver Post reported the Browns will, indeed, delay their decision until they speak with the play-caller. Klis was told that Gase, who turned down requests from Cleveland and the Minnesota Vikings earlier this month, likely would accept an interview after the playoffs. Determined to interview Gase, the Browns' front office is a good bet to wait around until Denver's postseason voyage ends before deciding on a replacement for the fired Rob Chudzinski. Incidentally, Broncos quarterback Peyton Manning is close with Jimmy Haslam due to their Tennessee ties, and the Browns owner certainly has his hands in the mix this time around. Former Titans coach Mike Munchak, who spoke with Cleveland on Monday, also has Tennessee roots, and previously whispered-about candidates James Franklin -- now with Penn State -- and Auburn's Gus Malzahn are tied to Haslam's beloved SEC. Cleveland is leaning toward the hire of an offensive-minded coach. Fans are antsy because candidates are being snatched up, but this isn't a race. Think back to 2007, when Bobby Petrino, Ken Whisenhunt, Wade Phillips, Cam Cameron, Lane Kiffin and Norv Turner all were hired before the Pittsburgh Steelers finally landed some nobody named Mike Tomlin. If Cleveland believes Gase is their man, the Browns will wait. UPDATE: Cleveland's pool of candidates was reduced by one Tuesday as Rapoport reported that Todd Bowles has pulled out of consideration for the job, per a source close to the Arizona Cardinals defensive coordinator.